fahamilah tiga anugerah-Nya yang menyelimuti diri ini! tidakkah kau mahu berfikir juga? melainkan tindakan orang tak berilmu! tidakkah dunia membuka matanya besar-besar? pendemo sofan menolak Bong Besar! sebutlah angkara siapa itu? Sebutlah jujur-jujur! Son: Dad, Imam Ghazali had said that if one knows one’s self then one knows that one do not exist. They will dwell therein (Hell) for all the time that the heavens and the earth endure, except as thy Lord willeth: for thy Lord is the (sure) Accomplisher of what He planneth. And those who are blessed shall be in the Garden: they will dwell therein for all the time that the heavens and the earth endure, except as thy Lord willeth: a gift without break. O ye who believe! if any from among you turn back from his Faith, soon will Allah produce a people whom He will love as they will love Him,? lowly with the Believers, mighty against the rejecters, fighting in the Way of Allah, and never afraid of the reproaches of such as find fault. That is the Grace of Allah, which He will bestow on whom He pleaseth: and Allah encompasseth all and He knoweth all things. Son: Dad, with all the calamity throughout the world and victims reaching to hundreds of thousands, some are reconsidering the Benevolence of God. What have you to say, Dad? Dad: Son, as I said earlier, all creations, intangible or not, is just like an animation movie on one compact disc (cd) in God’s possession and He has, I believe, a plenty of them. When you watch a movie on a cd, whatsoever happening is in the movie on the aforesaid cd, so Son, what is the big deal? Say: Then Allah’s is the conclusive argument; so if He please, He would certainly guide you all. Son: But why is it an animation movie? I am The Manifest and The Hidden. Son: Dad, must we accept Predestination without question? 1. It is the 6th tenet of Islamic Faith as taught by God to our Beloved Prophet Muhammad [pbuh] through Angel Gabriel. Once it became an Islamic tenet divinely created, it cannot be changed. Such being the case, every Muslim have to accept it without much ado. 2. By accepting Predestination, we also accept that God is All-Wise because He had promulgated that nothing is amissed in His Divine Plan including in our Predestination. 3. Unless we accept His Predestination, He will not increase our knowledge since we doubt His Greatness. And We created not the heaven and the earth and all that is between them in vain. We created not the heavens and the earth and all between them but for just ends. His are the most exalted attributes in the heavens and the earth, and He is the Mighty, the Wise. A parable, if you are a trainee in an Architect Firm but you expressed your doubt at the Architect’s ability, it goes without saying that he will never teach you anything. 4. Without predestination, our features such our nose, ears, mouth, eyes and others as well as our voices, hearing, sight, smell and others may move all over our body. Such being the case, we may wake up one morning and found our mouth at the place of our nose, our eyes at the place of our ears. To aggravate this situation, our voice is at the place of the one of the eyes hence we have to speak through our eye; our smell is at the other eye hence we have to use it for smelling; our hearing is at our nose hence we have to use our nose to hear and our sight is at our ear so we have to see through our ear. Can you imagine son, the chaos it can cause if there is no predestination? Dad: So son, be thankful and not ungrateful to The Almighty for Predestination. Son: Dad, is it true that God did not sleep? Dad: Son, if He is asleep even for a single moment, the whole existence and its system will be in topsy turvy. Allah! there is no Allah but He?the living, the Self-subsisting, Eternal. No slumber can seize him nor sleep. Hud (11):107- Note the phrase “except as thy Lord willeth”. The idea of a cd came from here. Hud (11):108 – – Note the phrase “except as thy Lord willeth”. The idea of a cd came from here. All my friends out there with me! And in calamities and destruction! Fill with love and tranquillity. To respite in its soothing bosom. Of an old wearied Traveller. Why do you cry little ones? I cry for my mommy! I cry for my Daddy! I cry for my sister! I cry for my brother? I cry for all my relatives! I cry for all my friends and their families! What happened to them little ones? A year had passed and they have not come home! engkau pasti bertanya mengapa Tuhan tidak membalasnya! pantas sekali kau menyebut-nyebut begitu! Cabutlah nyawaku Ya Allah! Cabutlah nyawaku Ya Rabbi! yang menyusahkan semua orang lain! aku rela mati Ya Allah! Ambillah nyawaku! Hidup ini satu ujian suamiku! ditanam hidup-hidup di depan mata! yang meminta wanita mendapat hak yang sama? setengah mereka menerima itu sebagai nikmat rahasia-Nya! fikiran akan turun meluncur pabila dikehendaki-Nya! tapi pasti nanti di alam yang satu lagi! But there are the eyes? Did not want to see! But there is the mind? Did not want to understand! You don’t need them anymore! Where do I begin to tell her? Not a moment passes but I yearn for her. How can I tell her I am so remorseful! How can I tell her I love her so! God please helps me (sobs)!!! You seem did not care and bother. Is she invisible to you? Being invisible no feeling too? You hurt her more and more? What had happened to mankind? Is there no such thing as love anymore? Is there no more decency? No respect for life and property! No respect for the disabled and the olds! No respect for the weak and human rights! Governance is more for self interests. Is this our parting legacy? For the next generation to be? This Patient is seriously ill! Is there a Doctor available??? Cahaya yang ada di dalam kelam …. Berskala Richter tujuh kekuatan goncang .. Son: Dad, how do one knows God is Great, Lofty and Vast? Dad: Son, all creations including space and time put together is lesser than a particle of sand to God. Son: Dad, can man be God? Dad: Son, that is like saying a grain of sand of the desert is the desert. Only a blind man mistook a tail of an Elephant is the Elephant. Son: Dad how do one be steadfast in remembering God in one’s worship? Dad: Son, all that is required is focus. If one can be glued to the TV focussing on the World’s Cup for hours than there is no reason why can’t one be focussed during our worship of God? Son: But Dad, how can we focus on an Invisible God whereas World’s soccer is visible? Dad: Son, you just need to remember His Name without spelling it out and then focus at it. It is just like remembering your own name without spelling it out and then focus at it. Son: But Dad, why can’t we spelt His Name and focus at it. Dad: In that case son, your God is the Letter(s) of the word you remember as God because God should be remembered without form and without shape. Nothing is similar to Him. Son: Dad, how do one explain that God exists to someone who does not believe He exists? Dad: Son, if you enter into a small Garden and you see all the flower plants were arranged in a beautiful way which enhances the beauty of the Garden. In addition, all the plants are pruned to a particular height which made them very attractive, do you believe there is a Gardener attending to them. Son: Of course dad, it goes without saying! Dad: Then it goes without saying when one sees the uniformity of the features of mankind, animals, trees, fishes, reptiles and others and each produce its own kind, there must be a God attending to it. Son: But Dad, if he still refuses to believe? Dad: Son, in that case he is “blind”. As I said before, “How can a ‘blind’ man see God when even the Sun he can’t see it?” So leave him alone “blind”. Son: Dad, is it true that in everything which God created there is merit in it? Dad: If not, then how can He be The All-Knowing and The All-Wise? Son: But Dad, are you saying that in all the calamities occurring in this world claiming thousands of lives there are merits? Dad: Yes there are merits, but as we are not as smart as God we could not discern the merits. I am very sure in the years to come, it may not even be in our time, the merits will be apparent. Son: Dad, can supplication change once destiny? Dad: Son, even the supplication itself is preordained so how can it change one’s destiny? Son: When was it preordained, Dad? Dad: At the time when the command, “Be!” was given. Son: Dad, when God commanded, “Do not curse Time because I am Time!” does that mean we have to worship Time? Dad: Son, what God meant by commanding as such is that a minuscule of His Essence manifested as Time. Similarly, when He commanded, “It is not you (Muhammad) who threw but it is I”. It does not mean that Muhammad is God but that a minuscule of His Essence manifested as Muhammad hence God commanded that He was the One who threw. Such being the case, you must not worship a minuscule of His Essence but worship Him. Son: Dad, is it difficult to know God? Dad: Son, as God cannot be seen by our two eyes what you need in order to know Him is an inner eye. Son: Dad, why must we love all God’s creations? Dad; Son, His Essence is in each and every one of His creations. So if you want Him to love you then you must love His creations. Son: Dad, must we plan if we are to be successful in life? 1. In order to plan, among other things, you must already be born; you are alive, not in coma, not mentally incapacitated and not an infant. All these factors are beyond our control. 2. The plan, among other things, it can be implemented and not constraint by human elements or factors (manpower, skills, corruption, crimes etc), money, government policies and intervention, war and nature (earthquakes, tsunami etc) and law. All these factors are beyond our control too. 3. Successful or not successful is, among other things, the result of the integration of all the above factors. 4. The factor of chance such as your plan was made, among other things, at the right time and at the right place. These factors too are beyond our control. Nor does He share His Command with any person whatsoever. Surely that is easy to Allah. So son, do you see now that mankind does not have the power that God has, to regulate their affairs which are inherently very complicated and intertwined with other factors and elements which may be or may be not tangible. Son: Dad, if all are preordained, are our thoughts and memories too preordained? Dad: Yes son, they too are preordained. Our mind is just like a computer receiving inputs before it can work. Every morning when we woke up, our mind is empty then the preordained thoughts or memories came streaming in. Thence, the mind starts working or “thinking” or “reminiscing”. Ali Imran (3):128; Al Maidah (5):128. Siapa Allah … Suatu Pertanyaan …. Atau …. Siapa Allah ?… Suatu Pertanyaan …. Yang tiada daya upaya ..
May help this lonely weary soul. Why do you hurt this grieving heart? Why do you rebel against your loved ones? Who are willing to sacrifice all! Just to see you safe and sound. Are you sick, are you well? Have you had your food or not at all? Are you safe, are you comfortable? Does your pocket have enough for the day? Is there enough warm in the room you stay? As long they are not before their eyes. That is how special you are to me! Will the World find Peace? When can we all be one? Everyone is but a Prodigy! I am now but an invisible man! I am now just invisible. apakah engkau akan mengatakan bahawa Dia tidak adil! tapi bisakah manusia itu mencipta seekor lalat? adalah itu juga dengan gerak gaib yang telah sedia ada! oleh seher syaitan-iblis jahanam itu! Lofty and yet I can see the mountain and the sky? you agree that it surely knows what we are doing now? going on at those places. All -Seeing, Hearing and Knowing. I am also ice and that is why I am crying. because if it failed then I will die. Patient – I have never been afraid, Doc. be afraid. This is called “Predestination”. Dad, can Predestination be changed? Dad – Son, you don’t pity the Goat, you send condolences! Dad, how to trust God wholeheartedly? is almost 100 years old. Yes, Dad. Grandpa once told me about it. Son, have you ever seen it moving in search of food? Dad, how can we be totally subservient to God? diperkosa oleh perasaan bimbang dan resah ..
tak dikait pun tak lurus ..
70 tahun dijauhkan kita dari neraka. Serta Abu Bakar, seorang sahabah. Disisi Allah, ini adalah besar amalan. Ada mulut tutup, jangan terlepas kata. Ditulis neraka tempat mereka ini. Namun berserah penuh kepada Ilahi. Serta pegang erat kepada tali Allah. Seluruh umat umat manusia menderitai. Perkara jahat di pandang baik sahaja. Masuk ke neraka di hari kemudian. Di dunia dan hari kemudian. Sudut mana dia masuk ke minda. Tipu helah mereka rosak sudah. Abdur Rahman I. Doi, Sharia: The Islamic Law, 443 (1989). Fushshilat (41):25; An Ana’aam (6):112; Terjemahan Sahih Muslim Bk4, 815 (1994). An Nisa (4):118; Qaaf (50):27; Hajj (22):4. Imam Ghazali, Rahsia Hakikat Sembahyang, 149 (1994). Terjemahan Sahih Muslim Bk. 4, 865 (1994). Terjemahan Sunan At Tirmidzi Bk 3, 635-636 (1993);Sahih Al Bukhari Vol. 8, 389-390 (1984). Al Araaf (7):20, 22, 27. An Nisa (4);120; An Ana’aam (6):112. Al Hijr (15):40; An Nahl (16):99; Al Mujaadalah (58):10. Syeik Abdul Qadir Al Jilani, Op cit, 189. Asy Syura (42):11. Al Iklas (112):4. Al Anaam (6):103. Terjemahan Sahih Muslim, Bk. 1, 1006 (1990). Al Jumu’ah (62):10. Al Ankabut (29):45;(Tafsir Al Azhar). Al Ahzab (33):35. Thaha (20):14. An Nisa (4):103. Syeikh Abdul Qadir Al Jilani, Futuh Ghaib, 27 (1990). Imam Ghazali, Rahsia Hakikat Sembahyang Menurut Tauhid<, Fekah & Tasauwwuf, 130 (1994). Ataupun tiada dalam pelanNya itu? Dengan itu tidak bijaksana Tuhanmu? Semuanya ada di dalam pelan. Maka kita tidak payah berusaha. Melalui berfikir kita akan berjaya. Kalau tidak, Allah tidak Maha Mengetahui. Dengan itu, Loh Mahfuz ada kecacatan? Maka tutup mulutmu yang celupan. Yang zahir dan batin ciptaanNya? Yang awal dan akhir ciptaan semua. Kelak di akhirat menjadi penyesalan. Kepada Allah mereka menyerah diri. Kesemuanya berfaedah untuk kita semua. Tiada apa yang menganiaya mu. Mustahil Dia buat yang mengkhianati. Ali Imran (3):47; An Nahl (16):40. Ash Shaaffaat (37):159; An Nahl (16):60. Terjemahan Sunan Ibnu Majah Bk.1, 66 (1992). Id, 66; Terjemahan Sahih Al Bukhari Bk. 8, 402 (1884). Syeik Abdul Qadir Al Jilani, Op cit, 55. Syeikh Abdul Qadir Al Jilani, Op cit, 145. Syeikh Abdul Qadir Al Jilani, Op cit, 43. Al Baqarah (2):169; Al Hajj (22):3, 8; Luqman (31):20. Syeikh Abdul Qadir Al Jilani, Op cit, 94. Al Baqarah (2):42; Al Anaam (6):82. 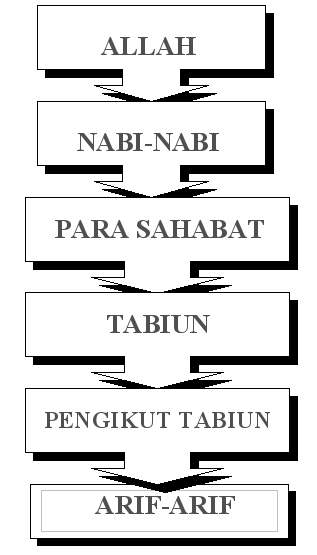 Terjemahan Sahih Muslim Jilid 1, 5 (1994); Terjemahan Sahih Muslim Jilid 1, 4 (1994). Al Baqarah (2):208; Az Zumar (39):12; An Anaam (6):14; Al Anaam (6):71;Al Anbiyaa (21):108; Al Hajj (22):34. Hammudah Abdalati, Islam in Focus, 7 (1980); Choiriddin Hadhiri Sp, Klasifikasi Kandungan Al Quran, 93 (1996). Terjemahan Sahih Muslim Jilid 4, 819 (1994). Al Fajr (89):27-30. Syeikh Abdul Qadir Al Jilani, Op cit, 19. Yunos (10):44; Ar Rum (30):9. Kepada yang Maha Besar Tuhan. Anwar Musadad mengiktiraf Injil ini. Tetapi Allah adalah Maha Besar Tuhan. Adalah kecil berbanding dengan Ilahi. Allah Maha Besar, Luas dan Tinggi. Dzat adalah Zahir dan Batin ciptaan. Dzat wajibul wujud kepada semua. Ini semua lakonan DzatNya jua. Termasuk ruang dan juga masa. Arahan dari Allah Yang Maha Esa. Di langit, di bumi atau di antaranya. Terjemahan Sunan At Tirmidzi Bk. 5, 342 (1993). Anwar Musaddad, Kedudukan Injil Barnabas Menurut Pandangan Islam ,30 (1981). Translation of Sunan Abu Dawud Vol 3, 1324 (1990). Kamus Dewan Edisi Ketiga, 1558 (2000). Ar Rad (13):9; Al Hajj (22):62; Al Mukmin (40):12; Ali Imran (3):73. Al Mukmin (40):56; Al Hijr (15):25; Al Mujadilah (58):7. Ali Imran (3):49. Gospel of Barnabas, 241 (?). Untuk menjadi murid di jalan ini. Sampai saat diam dan menanti. Takdir kini anda terima keseluruhan. Aboebakar Atjeh, Pengantar Sejarah Sufi dan Tasauf, 49 (1977). Aboebakar Atjeh, Op cit, 50. Abd Qadir Al Sufi, The Way of Muhammad, 169-179 (1997). Syeikh Abdul Qadir Al jilani, Futuh Ghaib, 95 (1990). Saiyid Ahmad Ar Rifai, Benteng Ahli Hakikat, 112 (1994). Saiyid Ahmad Ar Rifai, Benteng Ahli Hakikat, 140 (1994). Muhammad Said Ramadhan Al Buti, Keyakinan Hakiki, 112.
oleh mulut nan berdosa ..
Yang dalam kefanakan cinta dunia..
kepada sesiapa saja Dia suka…. Dia tidak menzalimi kita sekelian …. oleh Yang Maha Ihsan …. Dari Dia kita datang ..
Yang gunung pun tidak mahu kerjakan …. sampai ke perlabuhan Mu ..
Kalau jejari nak dara sunti ..
Turun naik tidak penat ke ? Dia tak jauh dari kita …. ampunilah hamba-Mu yang selama ini buta-hatinya! Bersyukurlah aku menemui guru panduku ini! bisik Syeikh Abdul Kadir Jilani lagi. menjadi aku sabar menunggu menjadi aku redo menanti! Cuma aku tidak tahu apakah aku akan menemuinya nanti? Aku menyerah total ke hadirat-Mu Ya Allah! Ya Raab! Lindungilah kami dari jampi-serapah syaitan-iblis laknat! Atau ikut agama moyang mereka. Di depan, belakang, kanan dan kiri. Sesudah itu Arif-Billah bertugas pula. Yang baru, Tasawuf Jalan Wali-wali. Yang mencari pengenalan kepada Tuhan. jika Dia mahu manusia seluruhnya menjadi Islam pasti akan berlaku! kerana semuanya itu adalah sebahagian daripada dzat-Nya yang kecil! Allah Al-Baari’u Yang Maha Penata! kembalilah semua tiada kecuali mengadap hisab-Nya! bisa tabrakan juga di mana-mana negara teknologi canggih? lalu aku menjadi gementar takut! aku terus menggigil kedinginan ketakutan selalu! Tahukah engkau tumbuh-tumbuhan itu makhluk serupamu? Tahukah engkau asal-mula pakaian yang menutupi tubuhmu? Dan benang itu asal-mulanya dari mana? Lalu kapas itu asal-mulanya dari mana pula? Akhirnya tumbuh-tumbuhan itu siapa yang menciptanya? menyampaikan makanan ke seluruh batang dahan ranting dan daun? apakah akan kau rujuk ilmu sainsmu juga? kerana di balik semua mahkluk ciptaan-Nya itu ada dzat-Nya! Ke mana saja kau mengadap di situlah Wajah Allah! tapi di keliling saya ini sekarang hanya pasir semata tidak saya lihat apa-apa pun juga! di mana pun di padang pasir kontang ini tapi jika kamu memandang dengan mata-hatimukamu tahu letak gubuk yang terbuat daripada batu dan pasir itu kerana kamu ada ilmu di mana letaknya gubuk itu jadi kamu perlu punya ilmu mengenal Allah dahulu baru kamu dapat melihat Allah! Ilmu mengenal Allah itu bukankah berkhaluat dengan Allah di tengah sepi malam dan siang lalu berzikir yang panjang tidak ada sudahnya Astigafirullah! Astagfirullah! Astagfirullah! Allahumasolli-ala syadina MuhammadWaala alihi wasahbihi wassallim! dan kemudian kita mendapat bai’at dari guru kita! itu tidak betul anakku, tidak! baik yang lembap ataupun yang kering; semua itu diketahui Allah! Dan hendaklah kamu sentiasa mengingat Allah di hatimu! Berzikirlah dengan hatimu bukan dengan mulutmu! Itulah ertinya Allah Maha Mendengar lagi Maha Melihat! ertinya Allah itu lebih daripada satu? Allah itu Tunggal Allah itu Yang Maha Esa! maafkan atas kebebalan saya ayah! ampuni hambu-Mu yang doif ini Ya Allah! jauh tapi dekat! Dekat tapi jauh! Tapi sekarang kamu tahu beda jauh dan dekat! tapi Allah itu dekat bagi mereka yang celik! Tahukah kamu di mana ayah menyimpan dinarku? kerana yang menghitung ayah sendiri ibumu tidak! God, you are really great! Deep into the Earth they are running. Deep in the Earth’s creases they are placed. Every one of them were astounded. By the raging Fire they were butchered. “God, You are really Great!” he said. They went to different Pre-University Institutions . At Queensway London, it was situated. Or back in his room to study. From his hostel was not far away. Ahmad “the Kampung Boy” had surfaced. They embraced each other in glee. “I am in the University” Ahmad replied. “I’m too in the University!”, Ah Poh said. When they were in their secondary studies. The Sun was shining with splendid rays. The room was full of aura. [†] Degrading remark about a malay coming from the “kampong”. Kampung in the early days was a wayward malay village. Facing a small Hill about 25 feet to the top . In the end she fell asleep at the spot. In the unending sand it was hidden . Carrying her Bottle of water in her Jacket seam. The water she needed to preserve. With her Jacket and Jean she managed. But this time her water none remain. She was caught with no place to lay. Down a Ridge she failed to see. It was but a big boulder along the fall. Knowing she would not see them again. And her tears fell unrefrained. As the dark night began to creep. To study the desert’s predicament. A red colour thing her eyes did see. She saw Jane sleeping beside the boulder. Jane just do not know what to say. “Angel, I coming to get you!” a voice of a Lady. “Thank you God, You really exist,” she did say. Many young ones left without mother and father. With his uncle who was also a fisherman. In his heart he cried and lament. Should they know there was no tellings. In a boat they row together. From spot to spot they move hither. The Savages drawing weapons at them. He was sure his life his father would offer. His father to the Chief did rave. The Chief signalled for him to go his way. Kukata would never forget until he is dead. If you dim the light …. If you killed the light will you see? From afar you see …..
Let me be in Your arm…. After both their parents gave their nods. Her pelvis in several place was fractured. 6 hours journey, Ali frown. She fell to the ground after a lurch. He was kicked instead of her. Ali was unconscious on the track. Watching Ali unconscious day by day. Her heart belong to him and no other. To note the pains love did reek. Watch the loving couple feeling astound. Sending well-wishers and Aliya in frenzy. He held her face and they embraced. Ali thanking God that she survives. Tears too fell from the nurses and doctors. Since he was then fit and trim. Covering in a large clothes in white. For Ali and Aliya to pull the white garment. Nama yang diberikan adalah “Manusia”. Rahimah, Rahim, Ali dan Aliza. Untuk kamu hidup sebagai Manusia. Maka kau masih belum beriman. Looking forward to earn your pay. Being employee looked so tough. You were all famished by nine o’clock. Then on the bed you faltered. But wait, who is that lady with a hat? A Gardener you now, behove! Wow! What now my darling? The house is in sprint cleaning? Gardening to you is no more joy. For you my dear, it is most welcome. And your back pain is the scoundrel. How much we yearning to see them. Dinner table is but a zen. Forgeting us in a huff. Sitting together with us, her parents. Making each other laughed is a treat.